Our throttle cable is compatible with all Weber throttle bodies & the Weberpower throttle lever. 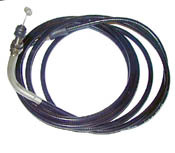 The 94" outer cable length is designed for Hydrospace S4 Jet-Ski, and other Weber based units that require a "finger operated" throttle lever. The 6mm throttle cable & lever assembly work well for most Kawasaki, Yamaha & most “stand up” jet ski’s.